A while back Mad Catz announced that they would be partnering with Capcom to launch a whole new line of FightPads and Sticks for SFV. During PAX 2 of these beauties were unveiled adn shared by MarkMan. 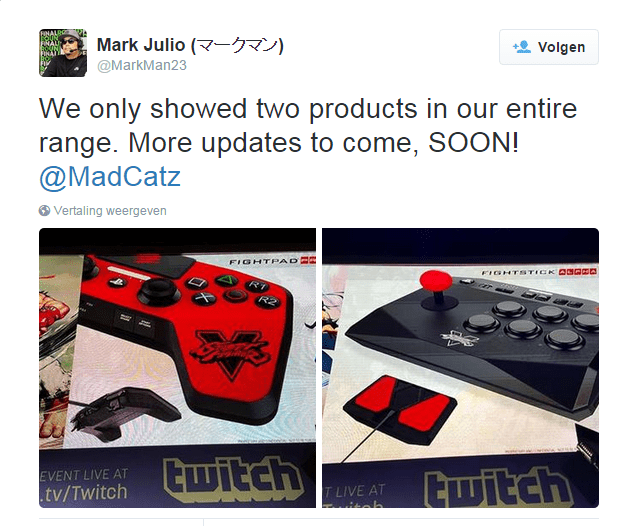 Mad Catz community manager Mark “MarkMan” Julio has shared following images on twitter. The FighStick ALPHA looks to be a smaller, more compact take on the more recent arcade sticks. Unlike most fight sticks, the ALPHA has only 6 buttons on the face, with the remaining buttons bumped off to the control panel. The ALPHA being a bit smaller could be a perfect fit for those who think the TE2 is too big for their needs. The FightPad PRO, features a touchpad and 2 analog sticks which is a first for the Mad Catz FightPad range. As with all other FightPads the 6 most important buttons for Street Fighter and most other fighting games are featured on the front of the pad. The FightPad PRO looks to be available in 4 colors ; Red, Whit, Blue and Black and has the SFV logo on it. Both the Pad and the Stick will be supported on the Playstation 3 and Playstation 4 and will offer the fighting game enthousiast like me a better way to play the games we love. More information is supposed to be coming soon, once more information is available we will let you know.